Senegalese opposition presidential candidate Macky Sall speaks at a celebratory news conference in the capital Dakar, Sunday, (Photo: Reuters). Senegal's Macky Sall claimed victory on Monday in a hotly contended presidential election over incumbent Abdoulaye Wade, who quickly conceded defeat in a move that could bolster the West African state's democratic credentials. Thousands of residents of the capital Dakar poured onto the streets overnight, honking car horns, beating drums and singing in hope of change after 12 years of Wade rule that has seen big infrastructure spending but little progress in tackling poverty. "The big winner tonight is the Senegalese people," Sall, 50, said of a smoothly-held election that contrasted with the chaos in neighbouring Mali after last week's coup by army mutineers. "We have shown to the world our democracy is mature. I will be the president of all the Senegalese," said Sall, a former prime minister for Wade who acrimoniously split from his mentor in 2008, told an overnight news conference. Wade, 85, in power since 2000, began his career as president with a sterling democratic reputation but drew criticism for seeking to extend his rule with a third term, setting off street protests in which six people were killed. 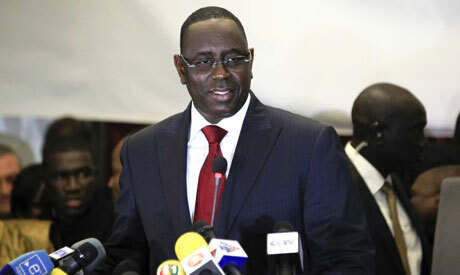 "Results coming in suggest Mr Macky Sall has won. As I always promised, I called him in the evening of March 25 to congratulate him," said Wade, who faced pressure from France, the United States and others not to stand for a new term. Mamadou Barry, one of thousands partying around Dakar's Place de l'Obelisque, the centre of months of anti-Wade protests, said the country where average daily income is $3 was pinning its hopes on Sall for change. "I voted Socialist in the first round but I am glad Sall won. Now we have to watch him to make sure he sticks to his promises," the 32-year-old shoe salesman said of a perception among many that Sall - like Wade an economic liberal - must still prove he can bring real change. "At last, 12 years of misery over. Now we have hope of change," said Sojul Diaw, 52, a chauffeur in Dakar. Sall campaigned for Sunday's election on lowering the cost of living for Senegalese, including by cutting taxes on rice. He had criticised Wade for pursuing vanity projects - including an African Renaissance Monument standing slightly taller than New York's Statue of Liberty - instead of helping poor Senegalese. The election was the latest test for democracy in a region plagued by bloodshed and flawed votes, including Ivory Coast's which triggered a civil war last year. Senegal is the only nation on mainland West Africa not to have seen a coup or civil war since independence. A military coup in Mali demonstrated how quickly a democracy can unravel.